﻿﻿﻿﻿﻿Lufkin offers woodland treasures, past and present. ﻿﻿﻿﻿﻿﻿Find Lufkin on a map, and you’ll see that it is nestled between two national forests — Davy Crockett National Forest to the west and Angelina National Forest to the east. The great pine forests have shaped life in East Texas for generations, first for the Native Americans and settlers who lived off the woods and later for the lumbermen who saw profit in the pines. Timber doesn’t have the same cachet as oil and cattle in the roll call of Texas enterprise, but 100 years ago, it was the state’s biggest industry. And it continues to play a major role in the region. 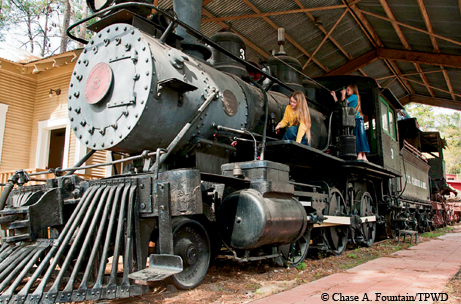 Lufkin is in the heart of the Pineywoods, a town that sprang up when the railroad came through, expanded with the timber boom and now serves as a regional hub for East Texas. I had visited the town a year earlier when I accompanied the Texas Parks and Wildlife Department paddling trail team on its survey of the Neches-Davy Crockett Paddling Trail on the Neches River. On my second trip, I am ready to delve deeper into what Lufkin has to offer. I start with the past, at the History Center in Diboll, south of Lufkin. Not quite a museum, not quite a library, it’s a remarkable archive and public history center documenting East Texas’ social and economic history. A permanent exhibit explores Diboll’s history as a sawmill town. It’s an interesting and impressive place, especially for a small town. History wields a heavier hand up the road in Nacogdoches, which sits along the historic Camino Real roadway into Texas and claims to be the state’s oldest town. But Diboll’s history may be more representative of life in East Texas. It’s always been a timber company town, and the continued presence of the industry is evident in the timber and lumber trucks rumbling through town. Only by recording this history will future generations know the real East Texas story. My East Texas story continues in Lufkin, where I meet Richard Donovan, author of Paddling the Wild Neches, for dinner. Worried that a dam might drown the land he loves, Donovan set off on a solo 200-mile canoe trip down the Neches in 1999 to highlight its scenic beauty and historical bounty. Donovan, whose pickup bears a “Neches” license plate, is still on a mission to show Texans that the Neches “isn’t just a ditch full of muddy water.” He was leading an overnight canoe trip that weekend for a handful of local residents. TPWD’s Neches paddling trail bears that out. The 9-mile trip takes paddlers through the highly scenic riverway near Davy Crockett National Forest, where tall pines and hardwoods line the riverbank. Birds serenade paddlers along the journey, and few signs of human presence exist. It’s just a few miles from Lufkin but feels like a world away. My first night’s stay is at Lufkin’s Southern Stables Bed and Breakfast, in a house built by a state senator in 1966 on several acres at the northern edge of town. Proprietor Dave Overdorf greets me as I arrive. He and his daughter are feeding the longhorns they keep on the property. Overdorf started with a couple of longhorns to enhance the ranch ambience of the bed and breakfast, but then his kids got into raising them and showing them at competitions, and their longhorn enterprise grew. To let me get a closer look, he shouts across the pasture, and Swoop, so named for his distinctive and improbable set of horns, comes running to us, along with a couple of other longhorns. After a good night’s sleep, I’m off to explore one of East Texas’ wildest places. The Upland Island Wilderness Area is the largest and most diverse wilderness area in the region. Its 14,000 acres lie within the Angelina National Forest. In this rich diversity, longleaf pine stands cover the uplands, and multiple varieties of hardwoods populate the bottomlands. Along the ancient Catahoula rock formation, groundwater seeps out to sustain several rare species of orchids, club mosses, ferns and all four Texas species of carnivorous plants. Aaron Friar of the Lufkin visitors’ bureau agrees to show me around this special place. 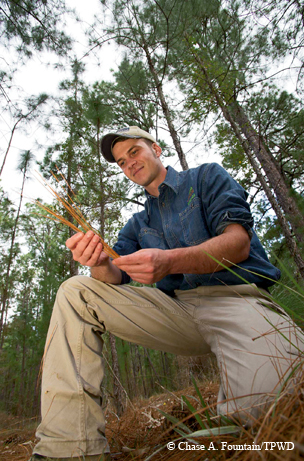 We start with a hike to High Point, a ridge where longleaf pines dominate. Longleafs were the tree of choice for loggers, and many of the longleaf forests were cut down, replaced by the faster-growing loblolly pines. But here, you can see East Texas as it once was: towering longleafs above a carpet of foot-long pine needles, with an understory of dogwoods, yaupons and blackjack and bluejack oaks. We linger for a while on the ridge, catching glimpses of sun shining through the morning mist. Upland Island is a land of giants. Some of the tallest trees in the state have grown here, including some former state and national champions. Friar takes me to the Neches River bottomlands where some of the big trees reigned. He says his favorite thing to do at Upland Island is to bushwhack through the bottomlands, and to me that sounds like a perfect way to spend a few hours. We set off through the woods, and pretty soon we run up against a thick palmetto grove where the palmettos are chest-high. This almost-impenetrable thicket might have been enough to make me turn around if I was on my own, but Friar continues on undeterred. Stepping over fronds, ducking under others and pushing branches out of the way, we fight our way through and eventually make it to more open woods. Friar shows me willow oak, water oak, swamp chestnut and a variety of hickories. He points out how the leaves of the cherrybark oak look like Chinese pagodas (hence the tree’s name, Quercus pagoda). After wandering through the woods, we realize we’re off-course. We want to make it to the Neches River, so Friar breaks out the map and compass, and we decide to pick up the pace so we can get to the river in time. We dodge trees and jump over downed branches, and we make it to the river just as we hit the turnaround time we’d set. 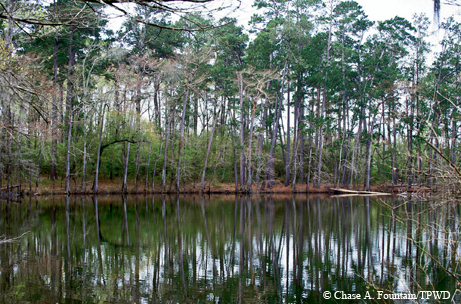 The wild Neches stretches before us — the natural and historical heart of East Texas. Donovan says Texas “was born in the Neches River valley,” and he’s got a point. Cabeza de Vaca and La Salle explored the area, and the first Spanish mission in East Texas was established near the river. The earliest Texans coming from America settled here. After our explorations, we set our bearings north and hike out. My next stop is nearby Boykin Springs, a U.S. Forest Service campground featuring a small lake and spring-fed creek set amid the pines. The campground and lake were built in the 1930s by the Civilian Conservation Corps, the same group that built many of our state parks. The picturesque park offers camping, fishing and picnicking, but I’ve come mainly to hike the Sawmill Hiking Trail. This charming 5-mile round-trip hike comes with a dramatic payoff at the end point, a feature that stirs the imagination with a combination of mystery and history. The trail mostly follows Boykin Creek as it gurgles over small waterfalls on its way to the Neches. At the end of the trail, the decaying concrete buildings of the old Aldridge sawmill emerge from the forest, looking like a long-lost temple in the jungle. 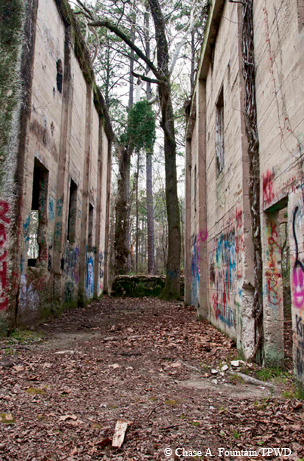 The buildings are covered in graffiti, and the forest is slowly reclaiming the ruins, with vines crawling the walls and trees growing inside. The Aldridge township, abandoned in 1927, once had 76 buildings. Four of them remain, in various states of decay. I stroll among the crumbling buildings, fascinated by the interplay of concrete and nature and the contrast of bustling sawmill and forest solitude. My accommodations for the night are in another abandoned sawmill town, Manning. The Mansion on Sawmill Lake, a bed-and-breakfast that opened in June 2011, is one of the few buildings remaining from what was a thriving sawmill community and the county’s second-biggest town. After the sawmill burned in 1936, the population dropped sharply, and most of the buildings were torn down. The town site is now a grassy hillside, giving no hint of the community life that existed there. The B&B is the former sawmill boss’s house, overlooking the sawmill ponds. When I tell proprietors Rodney and Judy Toups that I plan to visit the Texas Forestry Museum in Lufkin, they tell me not to miss the scale model of Manning showing the town in its heyday. At the museum, which features exhibits relating to the timber industry, the model fills in the blanks that my imagination didn’t, and it provides a vivid picture of the Manning of the past. 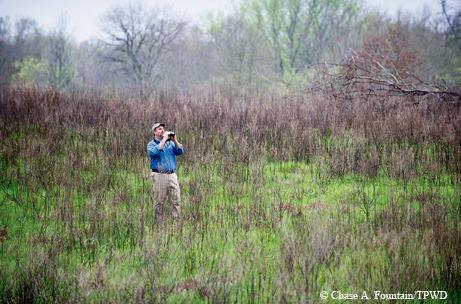 The next morning, I get up early to meet Cliff Shackelford, TPWD ornithologist, for some bird watching. Shackelford suggests we visit the Alazan Bayou Wildlife Management Area and the Stephen F. Austin Experimental Forest, both stops on TPWD’s Prairies and Pineywoods Wildlife Trails. When I pull up at Alazan Bayou, Shackelford already has a bird spotted in his binoculars. “It’s my first yellow-rumped warbler of the year!” he says. For Shackelford, bird watching starts with bird listening. He listens for bird calls and then looks for the birds, a technique he says works well in forested areas such as East Texas. He hears a Carolina chickadee and looks for it in a tree. Then there’s a downy woodpecker. He knows the calls well enough that he says it’s like hearing Johnny Cash on the radio. When Cash starts singing, you know it’s the Man in Black because you’ve heard his distinctive voice enough times to recognize it. It’s the same with Shackelford and birds. He trains his scope on a meadow, and we see more birds: eastern bluebirds perched on a fence and a handful of eastern meadowlarks scattered in some brush. East Texas has a few specialty birds that birders make the trek to see: pine warbler, Bachman’s sparrow, brown-headed nuthatch and endangered red-cockaded woodpecker. East Texas is known for having lots of woodpeckers, and our big payoff for the morning is seeing six woodpecker species, including Texas’ smallest (downy) and largest (pileated). The same can be said for visiting East Texas. With its abundant history and natural beauty, the region holds enough attractions to keep any visitor entertained and enlightened.